Amstrad 6128 video from Retro Man Cave – featuring music from ME! A bit of a different share here. There’s a brilliant new episode from Retro Man Cave about the Amstrad CPC6128, featuring some background music written and performed by yours truly (me) starting at around the 6:20 mark. The video is the first is a series called “Trash to Treasure”, which will be followed up in subsequent parts with repair, restoration and testing of the CPC6128. 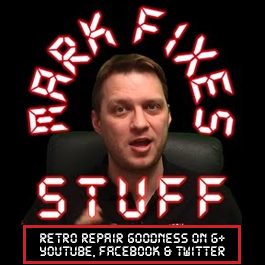 Retro Man Cave produces some excellent retro technology content, so I strongly suggest that you subscribe, and hit the bell to get notifications. Finally. I’m famous. Yay! Go me. What is a “dry solder joint” or a “cracked solder joint”?